4 players per channel with one ball. 3 yd gate in the middle, as shown. Unopposed: B checks through the gate to receive a pass from A, turns outside the gate to pass to C. Now A checks through the gate to receive from C, pass to D. Etc. Rotation: pass and follow. Semi-opposed: Outside/inside players hold their positions. One inside player receives to turn, while the second inside player shadow defends. Switch outside/inside players every 90 sec. MAKE SURE TO TEACH BOTH INSIDE FOOT AND OUTSIDE FOOT SPIN. Two teams. Balls with coach. Cones and goals set up as shown. One player from each team slaps high five over the blue cone. They race around the goal, back around the blue cone to see who can get through the yellow gate first. Coach plays to first attacker, who tries to spin the defender and score on either goal. Once goal is scored or ball is played out, next two players go. - Decision-making: receive with inside or outside of foot? 3v3. 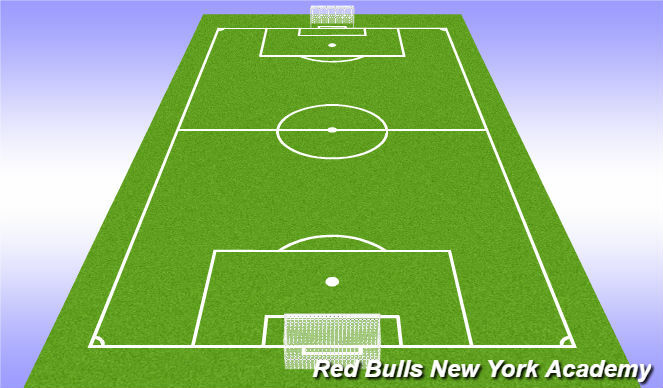 20x30 field with small goals, divided into two halves. 2 defenders, 1 attacker. Players must start in their zones. You can only win the attacking half with a pass, no dribbling. Once you connect with your attacker you can join the attack for 2v2. - Decision making: inside vs. outside? Spin vs. hold up? 30x44 field. 5v5+1 to big goals, no GKs. Field divided into thirds. Middle third: 2v2+1. Attacking/defensive thirds: 1v2. Extra balls with coach on sideline. Play starts in middle third. Make three consecutive passes then you can attack by passing to your #9, who tries to spin the defender and score. Midfielders can join the attack to create a 3v2. Coach restarts by passing to the team who just defended. - Decision-making based on defender's position: receive with inside or outside of foot? R - 3v3+1 in the midfield, 1v1 in attacking/defending thirds. Free play, coach in the flow.